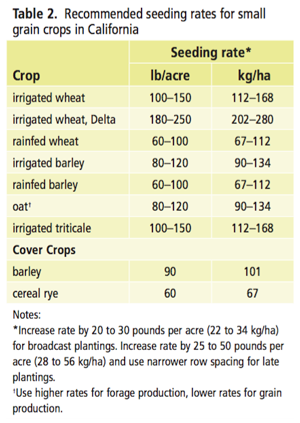 The optimal seeding rate is determined by sowing method and growing conditions (see table 2). For wheat it ranges from about 1 million seeds per acre (2.5 million per ha) for rainfed crops to 1.2 to 1.5 million seeds per acre (3.0 to 3.7 million per ha) for irrigated crops. Higher rates are used for broadcast sowing since a smaller proportion of broadcast seed emerges. Higher rates and narrower row spacing are recommended for late sow- ing to compensate for the fewer tillers that will form and because higher sowing densi- ties tend to shorten the time to flowering. Higher rates are also recommended if poor growing conditions (e.g., competition from weeds) are anticipated. High seeding rates help control johnsongrass and swamp smartweed in the Sacramento–San Joaquin Delta. Lower seeding rates can help avoid lodging, especially with barley and oat, when opti- mal growing conditions are expected. Seeding rates for barley are not as critical as for wheat because barley has a greater ability to compensate for a thin stand through increased tiller production. Cultivars can vary widely in seed size, as can different seed lots of the same cultivar, so the metering system of the grain drill must be calibrated before use. Certified seed tags may specify a thousand kernel weight (in grams), which can be converted to seeds per pound and seeds per acre. A seeding rate of 1.2 million seeds per acre equals about 28 seeds per square foot (300 per square meter), which equals about 106 pounds per acre (119 kg/ha) for a culti- var that has a thousand kernel weight of 40 grams.